I make homemade vanilla (thanks for the recipe) and trade it with my food co-op for products they produce. One of the lessons I have learned though our reduction of income in recent years is the idea that we need to remain flexible. For example, I’ve been married 22 years and with the exception of the occasional package of bacon or sausage, I’ve never purchase or cooked pork. With meat prices as they are now, pork has become the main meat we eat. It has taken some changes in the way I think, shop, and cook, but my family has adjusted just fine. Another consideration is realizing that we don’t always need what we think we need. If there is something that I am used to using, but find it to be out of my budget, I then consider what I can use as an alternative. We have learned, again to make adjustments. There are some things we don’t like as well and others that we have found we like better. The idea, for us, has been to remain flexible and be willing to try new things. In the end, it is all about filling the tummies with the healthiest food possible! Thanks, Laura! I”m looking forward to what your readers have to share. Prayers for a safe trip home for your family. We have been eating A LOT of pork too! I’ve found a few great recipes and have tried adapting our favorite beef recipes, without much success. I miss my beef, but am trying to maintain a good attitude about it all. Thank you, Lord, for food, however you provide it! I couldn’t agree more, Laura. It is a challenge to make the switch after cooking with beef for so many years. My biggest challenge is that it doesn’t naturally have as much flavor. You are right, though, we are incredibly thankful to God for His faithful provision. Imagine how many people in this world would love to be in our shoes – trying to figure out how to cook with pork. We are so blessed! I buy in bulk whenever possible. For example, my grocery store had grass-fed beef on sale for 3.99 a pound. The meat was short dated but I have a freezer and I’m not afraid to use it! I bought all they had that I could afford. I do the same whenever a great sale comes around on produce. I don’t can but I freeze whatever is possible to freeze. When sweet potatoes are $.29 a pound, I buy 20 pounds, precook and freeze them. I also have a garden in the summer and freeze the extras to use throughout the winter. One small way i save money (and appease my vegetarian husband) is when I make tacos, I use lentils in place of ground beef. It is 1/4 of the cost and easy. They only take 15 minutes to cook then I season them the same way I would ground beef. Plus once you get all of the “topping” on your taco you cant taste the difference. All four of my young boys eat it up. I only have a family of 3, but because of prices of grass fed beef and organic chicken, I only use half a lb when I make spaghetti or a casserole and I use 1 chicken breast when I make a noodle dish or casserole that calls for chicken. I’m always using less meat than called for as a way to stretch it. That way I can afford higher quality meat. It works for us! Funny you should ask today–right now–and tomorrow– I am waiting for UPS and/or FedEx to drop off packages of grocery staple items I buy in bulk. Because I cook whole foods at home, this will cover all our bread, rolls, tortillas, rice, pies, cakes, spices, seasonings, and much more, even toilet paper. I will place another order about mid-year. When I see almost any recipe, I have on hand the basics. When I go to the grocery store–every other week–I mainly buy fresh or frozen produce, eggs, and dairy. Buying in bulk and thinking of your budget in terms of a year rather than a week, really saves a lot of money. Last year I switched around how I menu planned instead of finding recipes then going shopping for those ingredients I now hit the produce & meat area buying what’s on sale (and good quality!) then I come home and find recipes that contain those items. Now I don’t feel obligated to buy the higher non sale item because of the time I already have invested in menu planning. We save money by using what we have. My kids work at a food ministry and bring home a variety of foods. We’ve learned to love asparagus, brussel sprouts, and artichokes (and tolerate eggplant). As a cook, I’ve learned to plan meals so that we don’t waste food and to use leftovers in creative ways. I also can or freeze fresh produce when it’s available. A good friend of mine told me if you cut your eggplant as needed for your recipe, then salt it heavily and let it sit for several hours it draws out the bitterness of the fruit. I presume you rinse it prior to cooking. Might help make it more palatable! My fave way to use it is sliced thinly in place of pasta sheets in lasagne-a little oil and salt, pre-grill until just cooked either side, and you’re in business for a delicious GF lasagne! I was blessed with a dehydrator add a wedding gift, and I’ve used it regularly whenever I can get fruit that’s almost had it, I get it really cheap and bring it home and dehydrate. Whole food snacks without added sugar! I’ve also just given it a workout drying beans from my summer garden. We use lots of resources to feed our family of 10. For the majority of our meats, we purchase a cow and pig from a local farmer. We save all year for them and then purchase the me. We try and buy them about 6 months apart for freezer space. Chicken is the one thing I still buy at Costco. I have kids who swear “real” chickens taste funny. I’m slowly converting them though. We use Costco for a lot of bulk purchases. What we save in buying their gas alone pays for our membership. We upgraded to the executive membership and earn cash back. Each year, we have earned MORE than enough to cover our membership and the upgrade plus some extra. For most of our grains, frozen fruits, some fresh fruits, and odds and ends we use Azure Standard. We’ve purchased foods from them for well over a year now, I’d highly recommend them. They have excellent customer service. To save $$, we also use a grocery app to record what purhases we normally make. Then when we make our bimonthly menu, I can put in what we need to purchase and it automatically goes into the correct grocery list. It even figures out our taxes. We never purhase everything at one store and we price check frequenly to help save as well. It also helps that my husand is list oriented and he likes to grocery shop. So he takes the list, rarely deviates and goes shoppin twice a month for us. Other than that, we try and stay out of the store! That app sounds interesting. I’d like to know more about it. Thanks. i use Azure Standard nearly every month! I try to go to Sam’s and Whole Foods whenever possible, but we live about an hour-one way- from both, so it is not very often… We live in a small town that only has the “generic” grocery stores and organic/better produce and meats are more expensive here. One way I save money on quality meat is to partner with my sister and mom to buy a grass-fed/pasture raised cow or hog. We can buy those meats at $4.00 a pound and then split the meat between the three of us. We also do this for the bulk coconut oil through Tropical Traditions and other items through Azure Standard and Amazon. By doing this, I do not have to come up with total amount myself to buy the beef/pork/oil and I can enjoy the quality for a great price. It also helps with storage issues to split the order! I use zaycon foods or pick up meat at the lowest price at Bakers and I buy from Azure standard almost monthly. Both of these stop me from going to the grocery store as often which for me saves us money. Im trying to cut down on grocery store trips to twice a month. I also use Kroger/Bakers Digital coupons on Simple Truth Organic products at Bakers. I menu plan and use half of the meat a recipe calls for. We eat a lot of meatless meals also. We have meatless Mondays, tuna recipes for Tuesdays, and I “shop” my pantry and fridge/freezer first, then the on-line ads, and make my menu plan from that. I make out my grocery list for just the items I will need to make the items on my menu. We also use less meat than a recipe calls for and add beans to stretch out the meat in meals like tacos or casseroles. We have meat a few times a week rather than every day. Also, frozen veggies are not typically unhealthy and can save a lot of time and money! Learning to freeze and can food saves a lot of money as well. 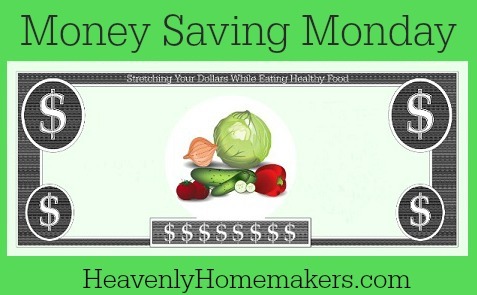 Making your own bread, tortillas, and granola can save a lot of mine as the healthier versions are expensive! I love to order from http://www.bulkapothecary.com. I get coconut & palm oils for cooking and essential & carrier oils from this supplier, and they have many other items as well. Their current price (1/5/15) for a 50 lb block of palm oil shortening with the cheapest shipping to my home is $88.35 – or $1.76 per pound. This new block I just purchased will last us 6 months or more, but it is much cheaper in mega-bulk, about half the cost of my previous supplier. This is cheaper still if I order with someone and get the automatic 15% discount on orders over $250. We use their reasonably priced shampoo and conditioner that is sulfite free. I buy chicken from Zaycon or stock up when the local grocery has it for the same price. I also LOVE Bountiful Baskets. There is a delivery fee, but a couple of my friends order w/ me and we can split that cost. They have great “extras”: juicing fruits/veggies, whole grain breads, organic produce, handmade tortillas and wraps, coconut oil and whole grains (for home grinding), just to name a few (you can check it out at bountifulbaskets.org). I also buy if bulk, stretch meat (brown rice in the taco meat). make meatless dishes, shop from my pantry and shop the sales. :-)) Thanks for the great tips. It’s so encouraging! We shop Aldi and Sam’s. It saves us a ton of money. My best money saving advice is the skip fancy recipes that require you to buy ingredients you don’t have on hand or use often. I often leave out or substitute a fancy ingredient for a more economical or practical ingredient. I can’t be a 5 star cook on my budget and some days I wish I had fresh herbs or a fancy vinegar, but running out to buy them for 1 recipe isn’t the best use of my funds. I have been sticking to simple real food recipes with basic cost effective ingredients. I make menus based on my own pantry and sale items. Also, I use left overs for casseroles or soups (freezing them if I am not using them right away). Leftover or stale bread is used to make croutons. Twice a year we clean out the pantry and freezer. We buy only milk, eggs and bread until we are down to almost nothing in the pantry. The meals get interesting, but it is great for the budget and can be as healthy as what you originally put in there. Garden and can, however you are able. A small plot in your yard, partner with others on a shared plots, help a neighbor with a plot, encourage your apartment/duplex owner to allow some of you to garden in the yard (check bylaws), talk to the college in your area to see if they would be interested in allowing community gardens. Even create a raised bed so you can sit and garden from a chair or wheel chair if you are not as mobile. Container garden on a balcony or deck (remember to water often). I was just reminded TONIGHT that we eat more vegetables (and less meat) with less arguing when I DON’T make a casserole or one-dish meal. Counter-intuitive, but true! If I make a main dish and a few different veggie sides, we eat the same amount of meat I would put in a casserole – or sometimes less! The key is having several different sides, so everyone can pick something they really like to eat – tonight it was glazed carrots, roasted cauliflower, baked potatoes, and baked sweet potatoes. There was chicken, too, but it was almost ignored in preference to the veggies! If we had company, I would have added in some bread and salad. I save money buy buying in season when I can. Also I purchase only what I know my children like and will eat For example I may see plums on sale but my children do not care for them so I may spend a bit more on a fruit of their choosing but I know they will eat it and it will not get thrown away. Also I use less meat than a recipe calls for and I try to “double duty” all my meals. Make enough for lunch the next day, make broth from the chicken carcass etc. Once a week I have a leftover day. I may not have enough for everyone but the different choices make my kiddos happy. One thing I thought I would mention is a tip that I use when stretching my meat for either taco salads or tacos…..for a family of 5, I only use 1/2 pound of hamburger and when it is mostly cooked, I add 3 or 4 grated potatoes, then use the same amount of taco seasoning you would for a pound or so of hamburger (to taste). I usually add a little extra salt too. Our family likes it better this way than the ‘right’ way to make it. As a rule, I am always telling my kids, you either save time, OR you save money. Don’t buy pre-made mixes, etc…most everything that is pre-made, you can find a recipe for. And if you want more money for your food budget, plan to cut down costs in other areas of your life…..like using cloth everything instead of paper products. Every little cost adds up over time. Right now wilderness family naturals is having a Christmas coupon sale. Their prices on coconut oil are already great but this makes them amazing. One thing I do when I run out of something like a spice or condiment or anything else is look online to see if I can make it from scratch with items here at home. For example, I make our taco seasoning but was out of chili powder…so I went online and found a recipe for chili powder, had all the ingredients for it and it turned out great. So now I have one more from scratch recipe on hand. We are very blessed to have an Amish bulk food store about 20 miles from us so I get all my flours and spices from them. Also make a big Aldies trip once a month since it is about 1.5 hours away. We do that and Walmart at the same time Also we live in a farming area so we get all of our meat from farmer Friends. And of course a garden in the summer then can or freezer what ever we can. We are blessed to live in an area that has several “grocery outlets” that have regular food close to the sell-by date, or various items that are discontinued in regular grocery stores. You can find unbelievable deals, even on organic food. Easily we have saved hundreds of dollars a month by doing most of our shopping at these types of stores. When unpacking groceries, I keep a piece of paper handy and jot down meal ideas so I remember what I bought and make a plan for each item. This saves me time and then I don’t forget the things I stick in the back of the freezer. Like others have said, I also use less meat than called for. In tacos, I usually add cooked rice, and in soups, bulk up on “cheaper” items, like pasta and carrots.